Poutine, a Québeque diner staple, usually consists of frites (French fries) topped with fromage en grains (fresh cheese curds) and covered with sauce brune (brown gravy spiced with a hint of pepper). Additional ingredients are sometimes added. La Banquise's Poutine Danse (Dance Poutine) includes poulet (chicken), oignons (onions), bacon and sauce aux poivres (pepper sauce). Poutine originated in rural Québec in the late 1950s. 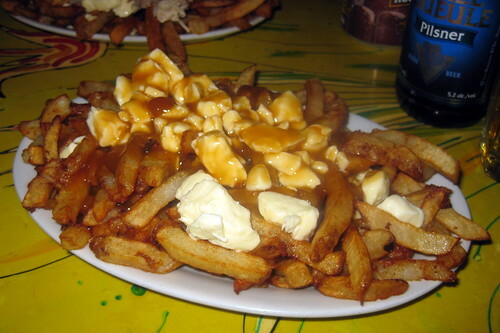 Several Québécois communities claim to be the birthplace of poutine, including Drummondville (by Jean-Paul Roy in 1964), Saint-Jean-sur-Richelieu, and Victoriaville. One popular origin story claims that poutine was invented in 1957 by Fernand Lachance when a customer ordered fries while waiting for his cheese curds from the Kingsey cheese factory in Kingsey Falls. Lachance is said to have exclaimed ça va faire une maudite poutine ("it will make a damn mess"). The sauce was allegedly added later, to keep the fries warm longer. Resto La Banquise, at 994 Rachel Est, was opened by Pierre Barsalou, a neighborhood firefighter, in May 1968 as a dairy bar. In September of that year, he did over the menu turning the restaurant into a 24-hour snack bar. In the 1980s, La Banquise introduced poutine to the menu in two varieties--Classical and Italian. In 1994, Pierre's daughters, Annie and Marie-Josée, took over the business and began slowly introducing different varieties of poutine. In 1999, Marc Latendresse took over for Marie-Josée, and today you can find twenty-five different varieties of poutine on the menu.